Mr. Eduard Biriucov, Secretary General of the PS IGC TRACECA informed Mr. Davlatali Said, Chairman of the IGC TRACECA, First Deputy of the Prime Minister of Tajikistan on a number of current issues in the field of the TRACECA corridor development after consideration of the Action Plan for the implementation of the IGC TRACECA Strategy up to 2015, and outlining the guidelines for action of the PS IGC TRACECA to the end of the year of 2014. Particularly, they discussed the most important aspects of TRACECA activity with reference to the development of the international transport corridor “Europe-the Caucasus-Asia” during the chairmanship of the Republic of Tajikistan in the IGC TRACECA as well as perspective activities of TRACECA and enlargement of the member states of the Basic Multilateral Agreement (MLA). The establishment of arbitration structure (International Arbitration Court – IAC) to the IGC TRACECA initiated by the Romanian Party was one of the most significant issues discussed. With the view of increasing the efficiency, status and level of TRACECA, arbitration court to the IGC TRACECA should be registered as the standing international commercial arbitration the jurisdiction of which will cover legal disputes between legal and physical entities irrespective of citizenship in one or another TRACECA member state. Currently Romania expressed its readiness to become the country of location for the arbitration court. Special importance is given to the issues of the current situation regarding the accession of Afghanistan and Turkmenistan to the Basic Multilateral Agreement. In the near future the Permanent Secretariat expects the completion of final procedures on accession of Afghanistan to the MLA TRACECA. Mr. Biriucov informed Mr. Said about the implementation of the on-going TRACECA projects, forthcoming preparation for the third TRACECA Investment Forum, the organization of which is planned for February 2015 in Brussels. 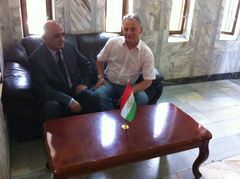 During the visit to the Republic of Tajikistan Mr. Biriucov met with Mr. Khayrullo Asozoda, Minister of Transport of Tajikistan. The key issues of discussions covered the improvement of multimodal transport infrastructure, strengthening of intergovernmental cooperation with organizations and companies involved in the sphere of railway and road traffic, optimization of customs procedures, measures on increasing the effectiveness of the transport system development within the Eurasian region. Tajikistan takes part in the implementation of technical assistance projects aimed at harmonization of legislation, improvement of tariff policy, institutional strengthening of TRACECA, human resources capacity building as well as transport infrastructure development. In this connection Tajikistan concentrated efforts on determination of the most significant projects for preparation of presentations at the Investment Forum. In compliance with the National Master Plan for development of the transport sector for the period of up to 2025 one of the main objectives for Tajikistan consists in consolidation of its position of a transit country between Central Asia, China and Indian subcontinent. The Strategy based on the National Master Plan provides for priority measures in the field of development of road and railway transport. This Strategy is matched to the key trends of the TRACECA corridor development representing common aspiration for considerable growth of international traffic and transport sector on the whole. Mr. Biriucov emphasized the significance and necessity of Tajikistan participation in the system “TRACECA Multilateral Permit” for international road traffic, as well as implementation of permit-free system within the ITC TRACECA. During several years TRACECA has been actively cooperating with international institutions aiming at the development and strengthening of the transport potential for effective communication between Europe and Asia. The participants of the meeting discussed cooperation with the International Road Union based on the community of interests in the realization of mutually beneficial projects and ideas contributing to the road transport development. These include the “Model Highway” initiative and creation of digital maps of roads along the transport corridor Europe-the Caucasus-Asia. The aspects of the TRACECA National Commission activity and the degree of its involvement in the EC technical assistance projects implementation were discussed with Mr. Solikh Muminov, National Secretary of TRACECA in Tajikistan.